Skiff is the result of the efforts put in by Hearst and it was previewed at this year’s CES. Skiff is an eBook reader like no other. It uses LG’s Micro Foil display technology that allows the device to be the largest and yet the thinnest eBook reader in existence. 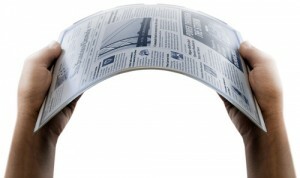 It is so thin that there’s a press photo of ir being bent and it look just like a piece of plastic being bent. But make no mistake about its features because it is pretty well packed and some people are saying that is looks better than even the Kindle DX. It comes with both WiFi and 3G, the latter of which is brought to you by Sprint. 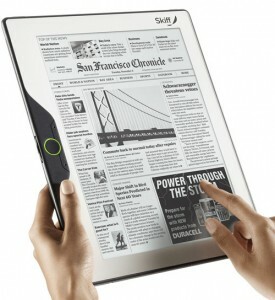 The device is optimized for large format print publications like newspaper and magazines. It will have an undisclosed number of tie ups with various content providers, including the San Francisco Chronicle, as seen in the image on the right. The reader is supposed to enable the distribution and viewing of print media content in rich visual styles including rich layouts and detailed letter faces along with dynamic updates to the device itself. They are probably referring to the availability of 3G on the device and pushing content over the air. It remains to be seen whether the 3G connection is baked into the price of the product like the International Kindle. The Skiff eBook reader will integrate with the Skiff e-reader service, which is the equivalent of the Whispernet on the Kindle. But instead of mainly books, think mostly periodicals that you have to subscribe to. The people behind the Skiff are hopeful that this device will help the industry turn around and make some money from subscriptions which are flagging. And the Skiff’s gorgeous and sleek looks are going to come in real handy in those efforts. Ars Technica has an article about how Amazon deals with stolen Kindles. Apparently, if you contact Amazon about a Kindle that has been stolen, they will de-register your account from the device. What they can’t do, however, is locate it or send a signal to kill or wipe the device. The article argues that it wouldn’t be very difficult for Amazon to add some sort of options for those who have had their Kindles stolen. Many other devices can be remotely wiped clean if the owner wishes, why couldn’t Amazon do the same? As eReaders become more widespread, more Kindles will have sensitive documents stored on them. If the Kindle was open for installing third party software, someone could easily provide this functionality. Now, it seems to be up to hackers to add this functionality. According to nielsen wire, average Kindle user earns Sprint $2/month. Given 12 cents/MB price this yeilds 16.6MB on average downloaded by Kindle user per month. This includes book purchases, periodicals, blogs and web-browsing. It’s hard to speculate as to how much each of these activities contributes to the total number… My guess would be that web-browsing and blogs are negligeble at this point. As to books vs. periodicals, I’d guess that average Kindle user subscribes to 1 periodical and the rest are book purchases. According to a reliable source in the know, The New Yorker’s Kindle split is divided 33% New Yorker, 33% Amazon, and 33% wireless carrier. At first 12 cents / MB may seem a little steep given that most mobile companies nowadays offer 5GB wireless broadband plans for $60/month (1.2 cent / MB). However bandwidth economics are a bit more complex. Sprint already has a 3G network and costs of operating it are fixed whether it’s utilized as 1% or 100% capacity. Therefore it’s in the best interest of the carrier to sell all of the bandwidth even if some of it is sold at a huge discount. Most individual users would use only a fraction of these 5GB and will subsidize users who use it all. With wholesale customers as Amazon there is no subsidies and Sprint would charge highest price Amazon would be willing to pay. 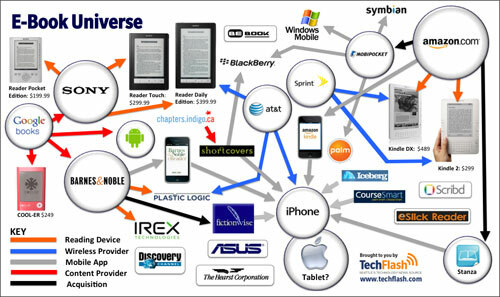 Average Kindle book is 0.7..2MB – Sprint gets paid 10..25 cents per download. Download doesn’t mean sale as customers can buy once and download multiple times. WSJ subscription – numbers are very similar to ones in MediaShift example – Amazon pays 4…5 USD per month for delivering the content. Personal document conversion – you pay Amazon 15 cents per megabyte, Amazon pays Sprint 12 cents. Consider that resulting document same size or smaller than then original because of data compression and you get a sustainable revenue model for Amazon even in the unlikely case of bandwidth price going up. Web browsing – free for users, same 12 cents per MB to Amazon. But how many customers really use it? I don’t. Whenever I need to browse the web on the go I turn to either iPhone or netbook if WiFi hotspot is nearby. In 2002 1 megabyte of wireless data used to cost more than a dollar. If this trend continues, wireless data costs will stop being a significant factor in Kindle economics 3-4 years down the road. However with current prices it’s quite possible that Amazon may get unhappy about Savory hack that allows users to download large PDF files and convert them on the fly directly on Kindle.